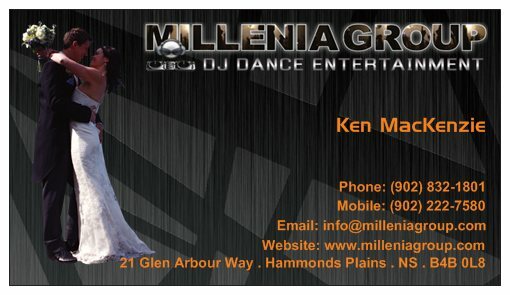 The Millenia Group is a full service disc jockey company providing DJ entertainment for Halifax and surrounding area. Our Disc Jockeys have provided the ultimate music entertainment since 1983 and have performed at numerous events and venues throughout Nova Scotia. The music entertainment is the heartbeat of your important event. At The Millenia Group we are fully committed to providing you with the DJ entertainment package that will meet and exceed your entertainment expectation. With a fully digital system with thousands of songs and multiple light and sound configurations available. We are as high energy or low key as you need and can assure you we will keep the dance floor packed. Today, value is more important than ever. We're determined to give you the most complete disc jockey entertainment package with no hidden costs. We invite you to compare our price, quality and commitment with other Disc Jockey services in the Halifax area. We love what we do. We love music, and we love the power it carries. There is nothing more exciting than watching a dance floor filled with people. We take great pride in what we do but our goal is not only to play music. It is to ensure that every party we do is better than the one before. You will find many Disc Jockeys who can bring up the energy of a party for a moment, and down the next. Our mission is to provide the highest quality, most reliable and exceptional disc jockey service to the quality conscious client who demands only the very best. Our business has been built on referrals. Your total satisfaction is our number one goal! Wedding DJ Packages - Simple, Elegant, Fun! Every wedding is unique. By listening carefully to you during your pre-wedding consultations, The Millenia Group pinpoints your specific tastes. We offer information and expertise based on years of professional experience. You can call or e-mail us as often as needed for wedding advice. On Time, Every Time. You put a great deal of time and effort into planning your wedding. We respect that. We are always set up a minimum of one hour before your wedding reception begins. The Millenia Group caters to your individual tastes, right down to every last detail. We will make certain that each "event" during your wedding reception is orchestrated the way you want it. Relax! Enjoy your reception.